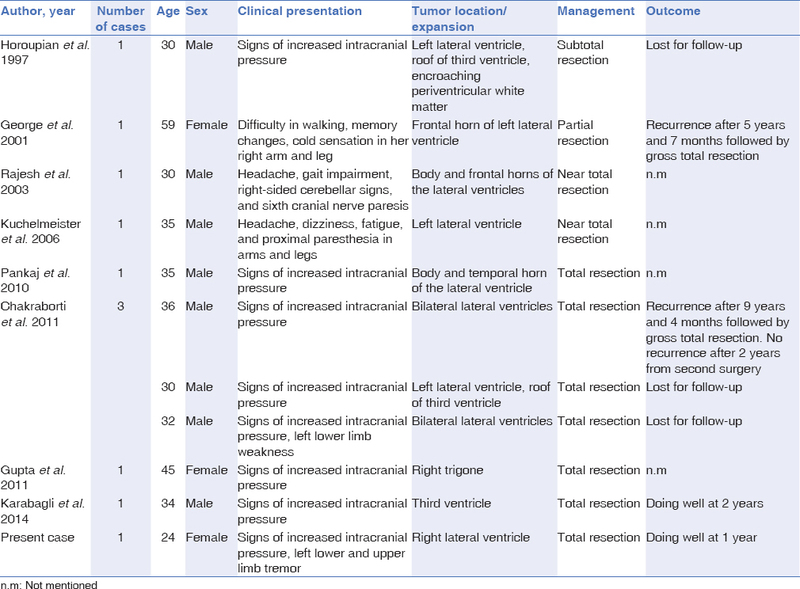 To the best of our knowledge, only 10 cases of supratentorial liponeurocytomas have been published to date [Table 1].,,,, This case report represents the 11th case and the first to present with “hemiparkinsonism.” We also emphasize the role of gross total resection surgery in the management of liponeurocytomas and also as a treatment for the “hemiparkinsonism” symptoms. A 24-year old, right-handed, female student without any significant medical, genetic, or familial history, presented to our outpatient clinic for the assessment of a left-sided tremor. She first noticed a resting tremor in her left leg during the autumn of 2014. The symptom progressed to include a left-hand tremor by the end of December 2014. She became unsteady a few weeks later because of her left leg bradykinesia and was dragging her feet. She also complained of a month's history of moderate headache without experiencing vomiting, dizziness, or vertigo. She did not have any right-sided symptoms. Her speech and writing were not affected. On examination, the patient was alert and oriented, without evidence of behavioral changes. She had a 4-Hz resting tremor in her left arm and leg with mild hesitancy in her left foot taps. Her left arm swing was also reduced with evidence of cogwheel rigidity. Her writing was normal. Her muscle strength, deep tendon reflexes, sensory examination, and plantar responses were normal bilaterally. An obvious pulsion was not observed in her gait. There was no papilledema on funduscopic examination, and her extraocular muscles were normal in all directions. Brain computed tomography (CT) scan with and without contrast administration (Brilliance 64-multislice CT scanner, Philips Medical System, MA, USA) demonstrated an isodense 5 cm × 5 cm × 6 cm mass lesion filling the body and the frontal horn of the right lateral ventricle causing ipsilateral hydrocephalus. The lesion was not associated with hypodense areas to suggest the presence of fatty tissue, and there was moderate heterogeneous contrast enhancement. 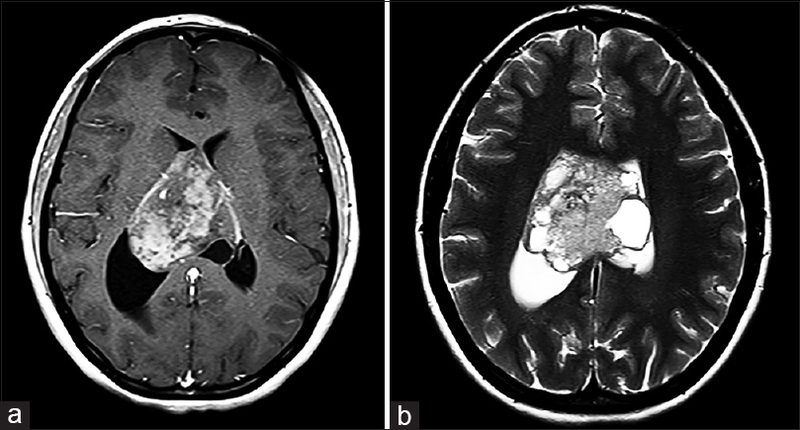 Brain magnetic resonance imaging (MRI) with and without contrast (Ingenia 3T MR scanner, Philips Medical System, MA, USA) defined the partially cystic tumor that appeared to originate from the septum pellucidum. The tumor was iso-intense to the brain parenchyma on T1-weighted sequences, hyperintense on T2-weighted sequences, and had heterogeneous enhancement after gadolinium injection [Figure 1]. The corpus callosum was not infiltrated. The patient was admitted for surgery, and a gross total excision of the mass was achieved through a transcallosal approach. Intraoperatively, the tumor was prone to bleeding and had several feeding arteries, which were carefully coagulated. Numerous cysts with a yellowish mayonnaise-like content were also found. The postoperative course was particularly significant due to the observation of immediate relief of the hemiparkinsonian symptoms. The patient discharged on the 6th postoperative day. The tumor tissue was fixed in 10% neutral-buffered formalin, and embedded in paraffin. Three-micron thick sections were cut for hematoxylin and eosin staining and immunohistochemistry. 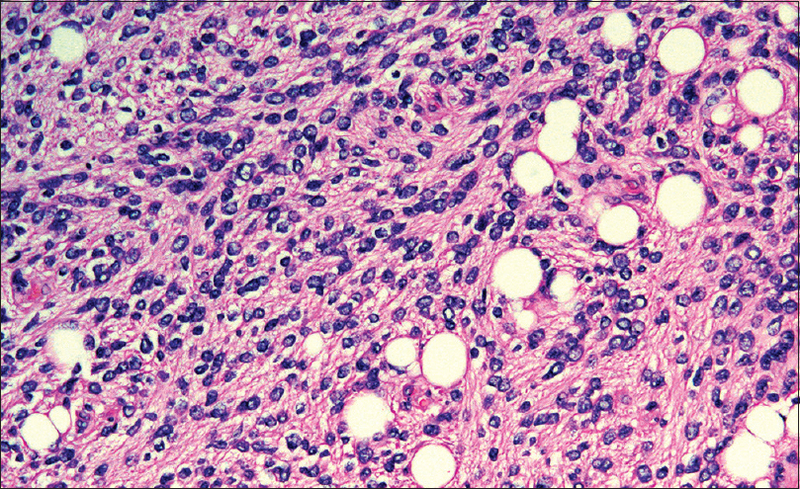 Histopathological examination of the tumor revealed a highly cellular neoplasm composed of small monomorphic neuronal cells with oval- to carrot-shaped hyperchromatic nuclei surrounded by scanty cytoplasm along with focal areas of cells with distinct cellular outlines, a large vacuole, and an eccentrically displaced or compressed nucleus resembling mature adipose tissue. These areas of lipomatous differentiation were distributed throughout the tumor and occupied nearly 10% of the tumor mass [Figure 2]. In addition to this, focal telangiectatic changes with dilated sinusoidal blood vessels were present, and although there were occasional mitotic figures, no necrosis or endothelial cell proliferation was noted. The neurocytic component was immunopositive for synaptophysin, neuron-specific enolase (NSE), and microtubule-associated protein-2, and the perivascular zones were highlighted by glial fibrillary acidic protein (GFAP), indicating glial differentiation. The Ki-67 proliferation marker stained positively in approximately 3% of the tumor cells. Based on these findings, a final diagnosis of lateral ventricle liponeurocytoma (WHO Grade II) was rendered. No adjunctive treatment was administered and the patient is symptom-free at the most recent follow-up examination, a year later. Liponeurocytoma is a rare tumor of the central nervous system showing neuronal and variable astrocytic differentiation, along with foci of lipomatous differentiation, and is usually located within the cerebellar hemispheres or the vermis. Till date, only 10 cases of supratentorial liponeurocytomas have been reported in the English medical literature [Table 1].,,,, Including our current case, there are 11 reported cases, with a mean age at presentation of 35.4 years and a male-to-female ratio of 8:3, with a predilection for the lateral ventricle near the foramen of Monro. Supratentorial liponeurocytomas have an age distribution and anatomical localization that is similar to their central neurocytoma counterparts. Signs of increased intracranial pressure are the most common presenting symptoms. Gait impairment, motor deficits, or memory changes can also be of significance, but hemiparkinsonism has never been described as a presenting symptom. Our review indicates that brain tumors are uncommon etiologies responsible for the manifesation of Parkinsonism symptoms. Previously reported cases include a frontal meningioma, a sphenoid wing meningioma, a low-grade oligodendroglioma, a temporal lobe infiltrative astrocytoma, a Sylvian fissure dermoid cyst, and a mesencephalic tumor. Tumors that presented with Parkinsonism generally had anatomical involvement of either the basal ganglia or the nigrostriatal tract. The marked clinical asymmetry observed in nearly all the reported cases, including ours, suggests that this kind of Parkinsonism is likely due to a presynaptic dysfunction of the nigrostriatal dopaminergic pathway due to the direct mass effect. The immediate resolution observed in our patient's hemiparkinsonism features after surgical resection supports this notion that local compression due to edema or mass effect could lead to a functional disorder in the basal ganglia, producing reversible contralateral Parkinsonism. Radiologically, liponeurocytomas appear as a hypo- to isodense tumor on the CT scan, containing hypodense areas exhibiting the attenuation values of fat. On MRI, the tumor is typically hypointense on T1-weighed imaging with scattered foci of hyperintensity corresponding to fat, with minimal heterogeneous contrast enhancement. On T2-weighted imaging, the tumor is usually mildly hyperintense with absent or minimal edema. In the present case, the tumor was isointense to the brain parenchyma on T1-weighted imaging, hyperintense on T2-weighted imaging, and displayed contrast enhancement with gadolinium. The cystic-appearing structures did not exhibit the CT density or magnetic resonance intensity of fat, thus our preoperative differential diagnosis only included a central neurocytoma or a meningioma. Rajesh et al., reported similar imaging features in 2003. In their article, the diagnosis of liponeurocytoma was also not considered preoperatively. Therefore, a thorough histological evaluation of the tissue is crucial for establishing an accurate diagnosis. Microscopically, a liponeurocytoma typically has a biphasic appearance. The immunostaining profile of previously published cases of supratentorial liponeurocytomas document uniform positivity for neuronal markers such as synaptophysin  and neuron-specific enolase. Expression of glial markers such as glial fibrillary acidic protein and S -100 was limited to some scattered reactive astrocytes and a few tumor cells along with tumor matrix. Central neurocytomas have a similar histological and immunohistochemical profile except for the absence of fat component. The presence of this fatty tissue within the tumor is imperative to differentiate the two entitites since the treatment required can differ drastically between them. Surgery remains the mainstay of the treatment but there is no accepted standard of adjuvant therapy, given the low occurrence of these tumors. Many authors have questioned the potential role of adjuvant therapies, especially the radiation therapy. Pasquale et al., described in 2009, a case of recurrent cerebellar liponeurocytoma with malignant histological features and a MIB-1 proliferative index of 15%. Chung et al., reported the case of a well-demarcated cerebellar liponeurocytoma with an unusually aggressive histopathology including focal areas of necrosis. More recently, Radke et al., documented a second recurrence in a patient with a liponeurocytoma with increased proliferative and mitotic activity. Considering such findings, Châtillon et al., suggested that patients with incompletely resected tumors or tumors with an MIB-1 index higher than 6% may benefit from postoperative radiation therapy. Previous reports estimated the recurrence rate for cerebellar liponeurocytomas as 31%, but no correlation can yet be drawn for their supratentorial counterparts. Of the cases included in our review, data are missing in seven cases, and in one case, the tumor recurred after 9 years and 4 months. Given the long disease-free period experienced in that patient and the 2 years of disease-free survival following his second surgery, we also believe that recurrent tumors should be considered for surgery with subsequent adjuvant radiation. However, since the understanding of liponeurocytomas remains limited, the exact prognosis and the optimal management protocol for supratentorial intraventricular locations still needs further studies with assessment of a larger number of cases. To conclude, liponeurocytoma of the lateral ventricle can affect young individuals and can present with hemiparkinsonism. Surgical resection can result in complete resolution of symptoms. As only a few reports exist pertaining to the natural history of this lesion, a long -term follow-up is mandatory. Bechtel JT, Patton JM, Takei Y. Mixed mesenchymal and neuroectodermal tumor of the cerebellum. Acta Neuropathol 1978;41:261-3. Horoupian DS, Shuster DL, Kaarsoo-Herrick M, Shuer LM. Central neurocytoma: One associated with a fourth ventricular PNET/medulloblastoma and the second mixed with adipose tissue. Hum Pathol 1997;28:1111-4. George DH, Scheithauer BW. Central liponeurocytoma. Am J Surg Pathol 2001;25:1551-5. Rajesh LS, Vasishta RK, Chhabra R, Banerjee AK. Case report: Central liponeurocytoma. Neuropathol Appl Neurobiol 2003;29:511-3. Kuchelmeister K, Nestler U, Siekmann R, Schachenmayr W. Liponeurocytoma of the left lateral ventricle – Case report and review of the literature. Clin Neuropathol 2006;25:86-94. Pankaj R, Jindal A, Banerjee AK. Liponeurocytoma of lateral ventricle. Neurol India 2010;58:805-6. Chakraborti S, Mahadevan A, Govindan A, Yasha TC, Santosh V, Kovoor JM, et al. Supratentorial and cerebellar liponeurocytomas: Report of four cases with review of literature. J Neurooncol 2011;103:121-7. Gupta K, Salunke P, Kalra I, Vasishta RK. Central liponeurocytoma: Case report and review of literature. Clin Neuropathol 2011;30:80-5. Karabagli P, Sav A, Pamir N. Does “cerebellar liponeurocytoma” always reflect an expected site? An unusual case with a review of the literature. Folia Neuropathol 2014;52:101-5. Figarella-Branger D, Soylemezoglu F, Burger PC. Central neurocytoma and extraventricular neurocytoma. In: Louis DN, Ohgaki H, Weistler OD, Cavenee WK, editors. WHO Classification of Tumours of the Central Nervous System. Lyon: IARC; 2007. p. 106-9. Lu CS, Chang CN. Hemiparkinsonism in a patient with frontal meningioma. J Formos Med Assoc 1992;91:1216-8. Domínguez-González C, Amosa Delgado M, Ramos-González A. Hemiparkinsonism secondary to sphenoid wing meningioma. Neurologia 2009;24:497.
de Sèze J, Defebvre L, Ruchoux MM, Blond S, De Reuck J, Destée A. Hemiparkinsonism revealing an infiltrating low-grade oligodendroglial tumor. Eur Neurol 1998;40:234-6. Ho BL, Lieu AS, Hsu CY. Hemiparkinsonism secondary to an infiltrative astrocytoma. Neurologist 2008;14:258-61. Akhaddar A, Mandour C, Belhachmi A, Boucetta M. Chronic headache and hemiparkinsonism due to a sylvian fissure dermoid cyst. Headache 2010;50:479-80. Yoshimura M, Yamamoto T, Iso-o N, Imafuku I, Momose T, Shirouzu I, et al. Hemiparkinsonism associated with a mesencephalic tumor. J Neurol Sci 2002;197:89-92. Pasquale G, Maria BA, Vania P, Gastone P, Nicola DL. Cerebellar liponeurocytoma: An updated follow-up of a case presenting histopathological and clinically aggressive features. Neurol India 2009;57:194-6. Chung SB, Suh YL, Lee JI. Cerebellar liponeurocytoma with an unusually aggressive histopathology: Case report and review of the literature. J Korean Neurosurg Soc 2012;52:250-3. Radke J, Gehlhaar C, Lenze D, Capper D, Bock A, Heppner FL, et al. The evolution of the anaplastic cerebellar liponeurocytoma: Case report and review of the literature. Clin Neuropathol 2015;34:19-25. Châtillon CE, Guiot MC, Roberge D, Leblanc R. Cerebellar liponeurocytoma with high proliferation index: Treatment options. Can J Neurol Sci 2009;36:658-61. Limaiem F, Bellil S, Chelly I, Bellil K, Mekni A, Jemel H, et al. Recurrent cerebellar liponeurocytoma with supratentorial extension. Can J Neurol Sci 2009;36:662-5.